I know this is not rocket science but it has come in so useful to me over the past week that I thought it would be worth sharing. As I whinged about mentioned in my last post, I've been pre-occupied and busy around our home the past few weeks packing for our upcoming big move and because of that I haven't had much crafting or activity time with my daughter while my son is at school. This never fails to make me feel guilty. I decided I needed a "grab & do" something. A something that involved no glue, no scissors and no box of craft supplies. I googled "Activity Sheets for 3 year olds", went to the first site on the list, "School Express", and began printing off multiple copies of the sheets I knew would interest her the most, and that had an educational slant (mainly to help with her numbers and sounds). I know there are literally hundreds of sites that offer the same thing but I didn't want to waste time searching and then become too bamboozled to make a choice. 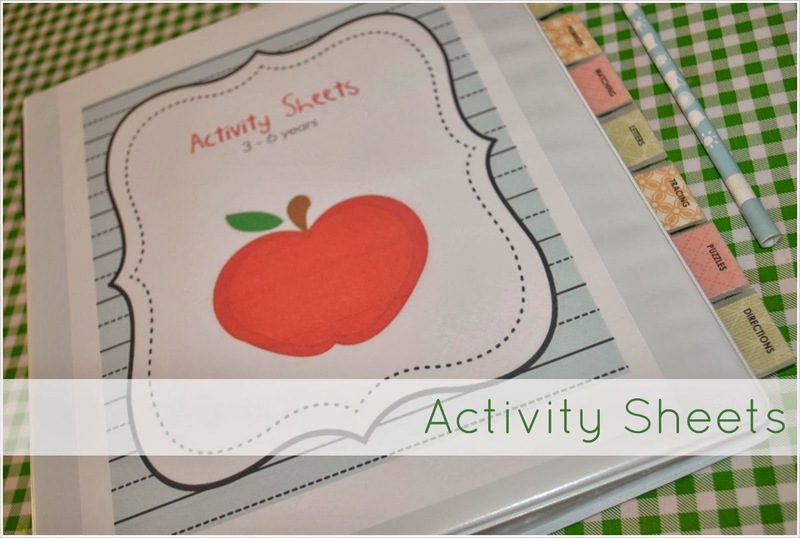 School Express has over 17,000 activity sheets (plus a whole host of other stuff that I didn't look at - again, I knew I would get sidetracked if I checked it all out) covering everything from Numbers, to Sounds, to Classifying, to Letters to Social Studies - exactly what I was after. I made up a file to keep the sheets organised and close at hand. I found these very cute and colourful free binder cover templates at A Year of Many Firsts blog, which were perfect, and saved me from making them up myself. The only problem was the files weren't editable (unless you had PowerPoint) and I wanted an "Activity Sheets" cover, so here's how I got around it. And, by the way, if you know of a smarter way to do it, and I don't doubt there is, please make sure you let me in on the secret! And because I couldn't find tabs that were visible under the plastic sheets, I made up some myself using patterned paper and clear adhesive labels from Avery. The tabs do stick out the side of the file but that doesn't bother me - a little jiggle when I pop it away makes the tabs slide back inside.